The Catalyst. No longer a piece of welded metal, but a piece of art! I don’t know about you, but today was a great day! 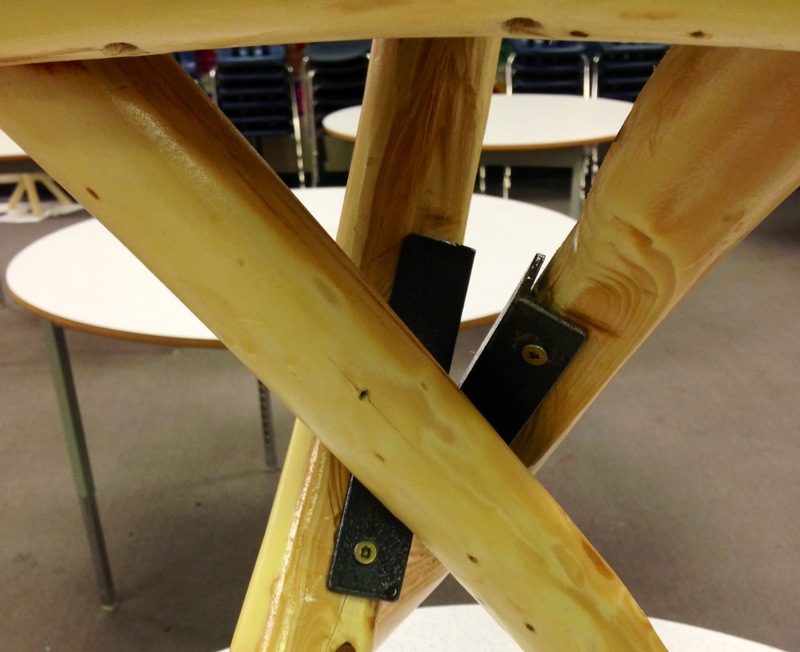 May 30 was Georges Vanier Elementary’s first ever WikiSeat Showcase. If you’ve been following our WikiSeat journey, you’ll know that it’s been one of great learning, risk-taking, and uncertainty. When our WikiSeat experience first began and we gave students catalysts, none of us…Ron O’Neil, Matt White, Hugh McDonald, Gallit Zvi, Francoise Rempel, or myself…knew where we were going or how things would end up. Our experiment also was very public as students continued their work during separate visits from educators Lindsey Own, Michelle Hiebert, Chris Wejr, and Kristin Peters. Today was such a rewarding day because of how our students rose to the occasion. With adults taking on more of a facilitator role, students were encouraged to think for themselves, solve problems, create something totally unique, and do this all for an authentic audience. This morning as WikiSeat participants sat ready to present their creations, hundreds of peers poured into the gym, viewed projects, and asked questions. We were visited by the local newspaper as well our District’s media department, making the learning very “real” for students. Best of all, learners were completely focused on what’s important…their learning rather than letter grades (which by the way were not assigned to projects). As I stood back and marvelled at how excited and proud our students were, I thought a great deal about school culture and about how school culture determines whether or not opportunities such as these every make it to students. It’s certainly a culture I try to foster at our school, but it’s a task I cannot do alone. I am thankful to the educators who participated in this project not only because they took part, but that they embraced and celebrated the sometimes messy and ambiguous learning that comes from innovation and creativity. Leaving our comfort zones was made easier knowing that we can ALL be creative, and that all students truly have the opportunity to shine in a culture of creativity! Great job Antonio and the staff and students at George’s Vanier! Such hard work by all, all in the name of creativity! Love it! Oh, how wonderful! I’m so jealous Gallit and Hugh and others get to teach with you at the helm. What a wonderful project. I love seeing the amazing products. Thank you for also pointing out that the students were not assigned letter grades for their projects. I think you know where to go next. Keep inspiring creativity in the culture of your school. Teachers and students alike can be creative and have a chance to shine! Thank you Denise. I love this kind of work and the kids obviously do as well. There was almost no talk about grades. Conversation was about solving problems, working together, and doing work that is different than that of others. Antonio, you are an inspiring guy, whether it is through your blog or face to face I always learn something. I agree with what you said about the culture. I always find myself a little sheepish talking about the work we do because I know not every building has the same culture we do, but you are right when you say the culture dictates whether or not a learning experience like this one actually gets to the students. Do you find it hard to share knowing that your culture won’t necessarily exist in the buildings you are sharing with? I love the idea of a “catalyst”. I think providing the one piece sparked kids in so many different directions that it clearly was not a hindrance to the creative process which I would have been worried about. I understand the point you make about sharing what’s happening at our site. I am completely comfortable with it because I know that it was through others sharing their own ideas that we came to hear about engaging ideas such as WikiSeat, Genius Hour, Mystery Skype… If others would have kept these great idea to themselves, how would this innovation spread? I was just speaking with a few staff members regarding Wikiseat and we are curious to see how many Surrey schools will be involved next year. If a few take it on, we’ve done our job. In terms of the catalyst, we purposefully didn’t share with students what the catalyst was for and let them struggle with it. I think that’s why kids came up with so many different ideas. All I know is that they loved it and made me so proud in how they took the personal initiative to pull their projects together!